Some young adult novels are hard to categorize in just one area alone. 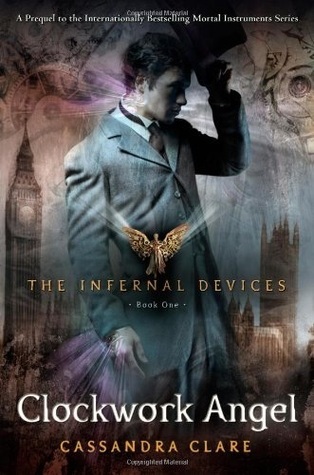 Such is the case with Cassandra Clare’s effort, Clockwork Angel , the first book of The Infernal Devices series and prequel to her bestselling series, The Mortal Instruments, which comes across as a fascinating delve into the magic of urban fantasy while still maintaining a strong steampunk undertone. Tessa Gray comes from the United States to England at the behest of her brother, Nathaniel, who promises her a good job and pay. In mourning after the passing of her caretaker and aunt, Tessa arrives in London and immediately meets two elderly women, sisters by the names of Mrs. Black and Mrs. Dark. They represent their brother, that tell her, since he is unable to meet her at the time. Tessa reluctantly goes with them and immediately realizes two important things: the two sisters use magic, and that her life is in danger. Tessa is trained in dark arts as well, though she is reluctant to do so. She learns how to change — to assume someone’s shape, form and memories — simply by touching something they once owned. As she grows stronger, she learns that she is to be given to the Magister — a man of much power and influence in the dark London magical underworld. Tessa tries to escape but is caught almost immediately. The sisters tie her up, but she struggles to escape once more — and runs into a boy, no older than she, who is trying to break in to the house. Will is a nephilim (a descendant of “relations” between an angel and human somewhere in his family’s past) and is hunting the murderer of a girl Tessa “changed” into to please the sisters. After a brief battle with Will, Tessa and the evil sisters, Mrs. Black is slain but Tessa is knocked unconscious. She is then taken back to Will’s home, called The Institute, where she meets the other “Shadowhunters” and their allies: Brother Enoch, Charlotte, Sophie, Jessamine, Thomas, and the mysterious Jem. Part of the allure of the story is the cross-mesh between a good steampunk story and an urban fantasy, something that the author does rather well. Her characters are all varying individuals with their own reasons and desires, while they still maintain their friendships and relationships, and don’t come off as trite cardboard cutouts of anyone else. Ms. Clare does a wonderful job with the painting of the character Jem who, despite being sick, is a very skilled nephilim and shadowhunter. Another compelling piece of characterization comes from Tessa’s motivation: her brother Nathaniel. She is willing to do anything, and go to any lengths, to save him. The twists and turns Tessa must face and overcome throughout the length of the novel makes for a fascinating read, and while it has a few minor bumps (there are some points where the story stalls, albeit briefly), it’s a wonderful introduction to an authors works. With a twist you don’t see coming and a betrayal you almost wish you’d seen, Clockwork Angel is sure to leave the reader pleased. This entry was posted on January 15, 2013, 5:25 pm and is filed under Book Review. You can follow any responses to this entry through RSS 2.0. You can leave a response, or trackback from your own site.